It took us awhile to revisit S&R Nuvali after our not so good experience during their opening last November. So kahit mas mahal tolgate ng S&R Alabang, doon pa rin kami but last Saturday, we paid a visit. Before doing our grocery, we dropped by at Solenad 3 to have our lunch. 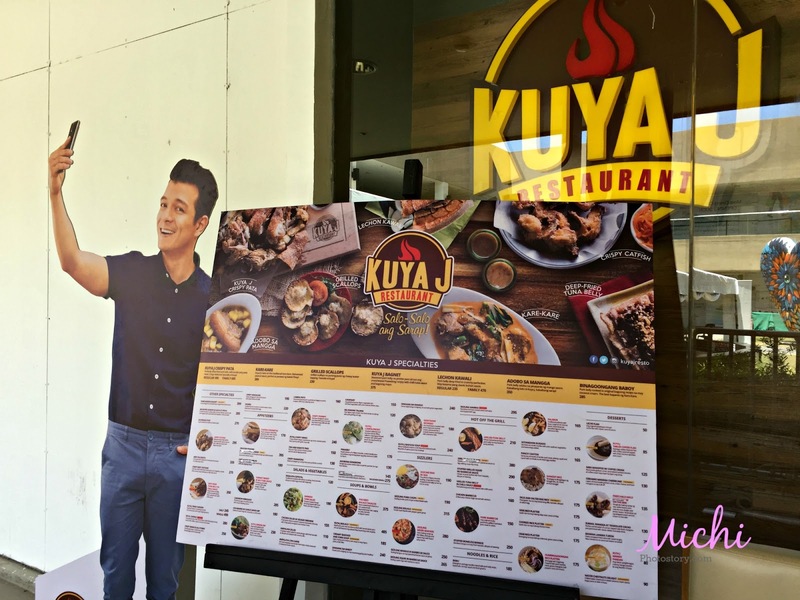 Just in time, Kuya J Restaurant is already open and it was their grand opening day. I told hubby, dun na tayo baka darating si Jericho Rosales. Hehehe! I have long time crush kay Jericho, as in contestant pa lang siya sa Eat Bulaga, crush ko na siya. But unfortunately, wala si Jericho so we just browsed the menu.There are so many choices but we just chose from their House Specialties. 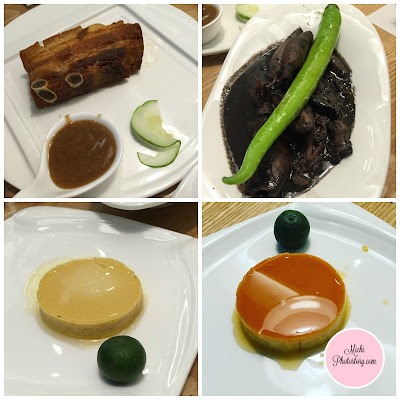 We ordered Kare-Kare Bagnet P399, Crispy Dinuguan P195, Plain Rice Platter P120, Ice Tea Pitcher P120 and Leche Flan P50. I was happy with their price, if you will compare it to other restaurants that serve Flipino foods, affordable ang Kuya J. No service charge. When the meals were served, I asked hubby parang ang konti ng serving, kasya ba sa tin? My husband said, kasya yan. True enough, it was enough for three persons. I was surprised to see the Crispy Dinuguan because I was expecting that it was like the crispy dinuguan of Kanin Club. 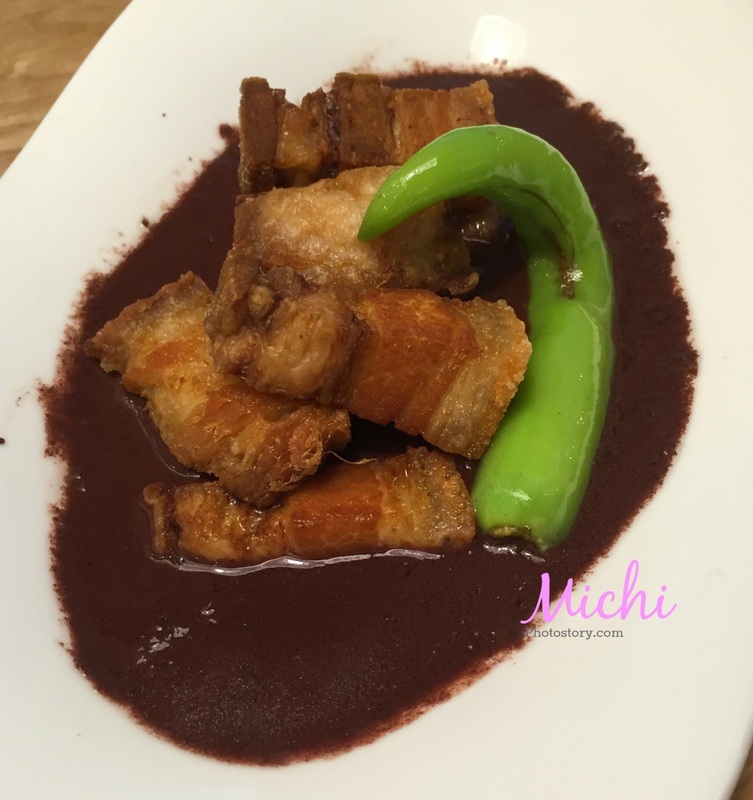 I was wrong, so it is like Bagnet Dinuguan of La Finca Tagaytay. So ending puro fried pork pala lahat order namin in different sauces. hehehe! My husband loves the Kare-Kare because you can really taste the peanut in the sauce. The sauce is thick and you know that it is made from scratch. I’m also satisfied with my Crispy Dinuguan. 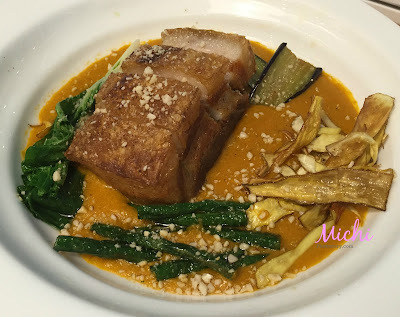 My son likes the bagnet of kare-kare, he likes crunchy food kasi. 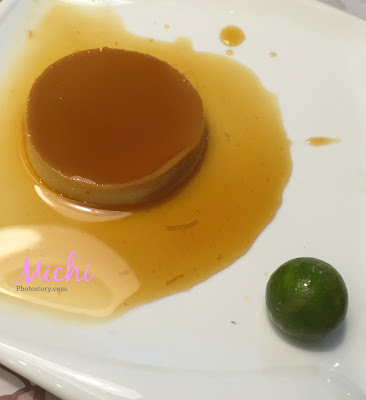 The Leche Flan is smooth and sweet, there is calamansi at the side, pang-alis umay siguro. Service is also good, ang daming staff everywhere, not sure kung dahil grand opening day lang. 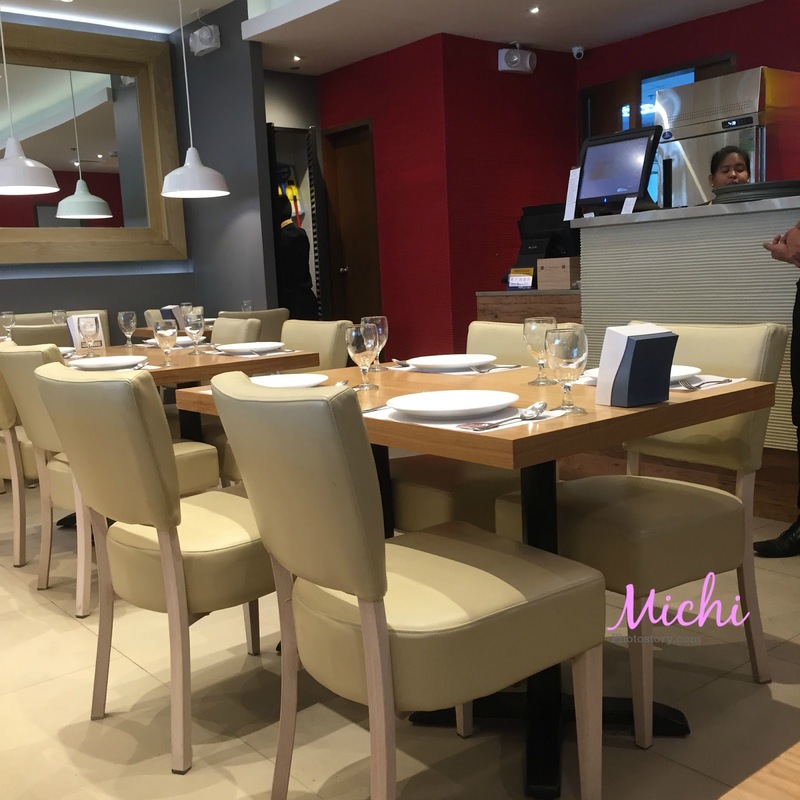 We now have new favorite restaurant in Nuvali. We had a free picture from photo booth after we ate. We went back again at Kuya J Restaurant after my son's Recognition program. We ordered Lechon Kawali P235, Adobong Pusit P270, Rice Platter P120, Pitcher of Iced Tea P120 and 2 Lechen Flan P50 each. 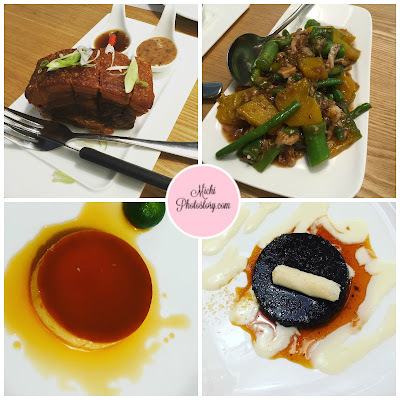 We're happy with our food but not with service, I don't know why it will take them so long just to serve the leche flan, I think 15 minutes of waiting and 3 follow-ups are too much, I'm sure luto na yan. We wanted to go home asap because my husband needs to pack his things for his Malaysia trip. My husband asked for the bill and canceled the leche flan order. We received the bill with leche flan charge, good thing dumating na rin leche flan so di na naman pinabago. We were in Solenad 3 last Saturday, after our haircut we ate at Kuya J again. We ordered Bagnet, Pinakbet, Leche Flan and Tablea Coffee Flan. I thought the tablea coffee flan is like a leche flan with flavor but I was wrong, parang kakanin siya. hehehe! Before going to S&R, we went to Kuya J for our late lunch, we ordered Crispy Dinuguan P195, Sizzling Sisig P190, Rice P35/cup and Leche Flan P50. 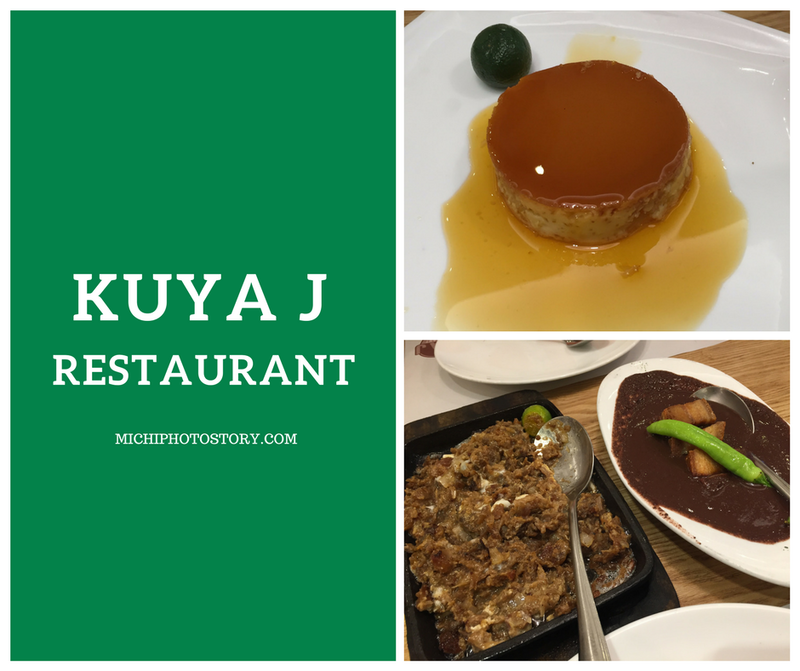 It was our first time to order sisig and the taste is ok. We always like the leche flan of Kuya J but last December, parang iba na taste niya. Hindi na soft and creamy, iba na kaya ang supplier? Di mo lang nakita, sis. Nasa labas ng restaurant si Echo... Hawak ang board ng menu... Hehe!